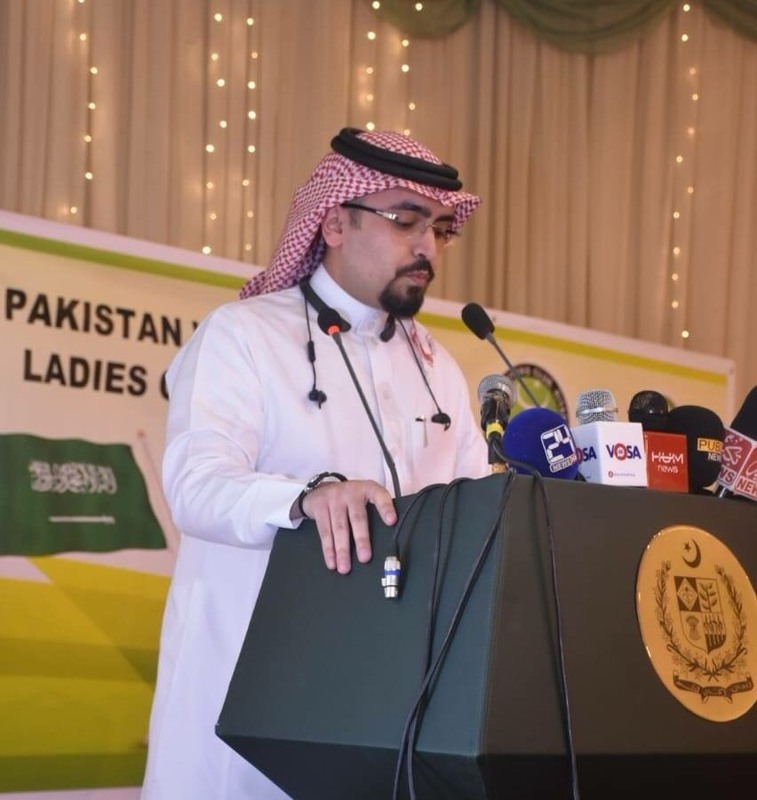 Pakistan Writers Club-Riyadh (aka: PWC) and its Ladies Chapter (aka: PWC-LC) hosted its Annual “Inter-Gulf Mushaira” to mark the 71st Independence Day of Pakistan and the Saudi National Day in collaboration with Embassy of Pakistan at the Chancery Hall of Embassy of Pakistan in Riyadh last Friday. Counselor Dr.Bilal Ahmed was the chief guest. Saeed Ashar, a well and senior Urdu Poet presided the event. Poets Iqbal Tariq from Bahrain, Qudsia Nadeem Lali from Khobar and Shaukat Jamal from Riyadh were the Guests-of-Honor. A large number of people from different walks of life were present from across the Kingdom, along with the Pakistan Embassy officials. The audience enjoyed themselves while listening to these poets.Besides senior and famous poets, young poets also received warm applause for their poetry renditions. Poet Yousuf Ali Yousuf - General Secretary of PWC - kicked off the event and briefed the audience about the purpose of this get-together. Abdul Rehman Khalid Algreemil - a Saudi National - appreciated PWC and LC for organizing such a wonderful evening. He appreciated the deep down friendship of Saudi Arabia and Pakistan. Dr.Farah Nadia, Shumaila Malik, Madiha Noman, Dr.Naghma Rehan and their kids, Daniyal Ahmad, Ayaan Gauhar, Ayaan Ahmad and Abdullah Fawaz. This skit presentation was greatly appreciated and received big round of applause from the audience. 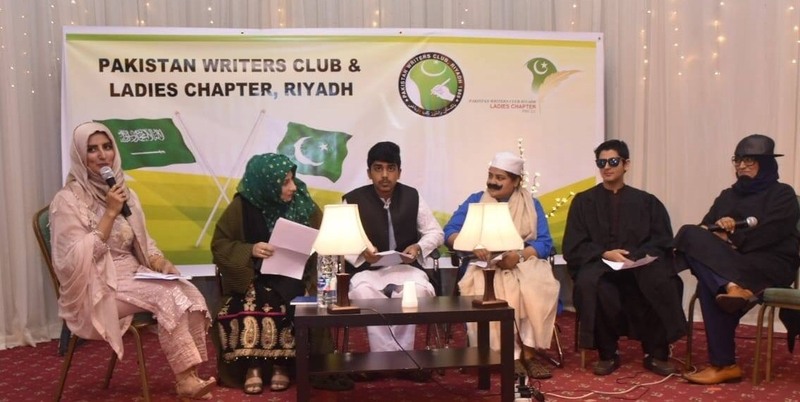 Several prominent poets and poetess from Bahrain, Dammam, Al-Khobar and Riyadh participated in this Mushaira.They included: Saeed Ashar, Iqbal Tariq, Qudsia Nadeem Lali, Shaukat Jamal, Ghazala Kamrani, Hesham Syed, Saleem Kawish, Masood Jamal, Mohsin Raza, Waqar Naseem Wamiq, Sabir Qashang, Sadaf Faridi, Shahid Khialwi, Peer Asad Kamal, Mansoor Chaudhary, Sajida Chaudhary, Shahnaz Akhtar Qureshi, Zubair Ahmed Bhatti, Shumaila Malik, Dr.Farah Nadia and Aymen Zaheer. Saeed Ashar – President of Mushaira - mesmerized the audience with his enthralled pieces of poetry. He congratulated PWC for arranging such a delightful evening. The Honorable Counselor Dr.Bilal Ahmed, praised the efforts of PWC and LC for arranging such an entertaining evening. “Pakistan has a rich history of poetry and literature of which Mushaira is an important part. He lauded the initiative and emphasized that such literary sittings must be hosted every now and then, ”Bilal commented. Fayyaz Malik - President of PWC - mentioned that it was very nice to have poets from all over the Kingdom and also from Bahrain. He thanked all the poets and the audience for their lively presence. He also thanked members of the PWC and its ladies chapter for their hard work in putting up such a tremendous event. He apprised the audience that the Embassy of Pakistan has always been supporting & helpful to PWC in hosting such events. Finally, he had words of thanks for the Ambassador of Pakistan Khan Hasham bin Saddique and his officials. Memento shields were awarded to the Counselor Dr.Bilal Ahmed. Others who also received the memento shields were: President of Mushaira Saeed Ashar, Dr.Farah Nadia PWC-LC Convener and Yousuf Ali Yousuf - GS PWC. Certificates of appreciations were also provided to all the poets and the skits participants. The event concluded with a sumptuous dinner.